When collaboration between media agency, creative agency and media owner is done correctly, the results can be very impressive and can really show-off DOOH’s true potential for all to see. A campaign for Mini was a great example of this, with Knight citing it as one of her favourite DOOH campaigns that JCDecaux has carried in recent times. 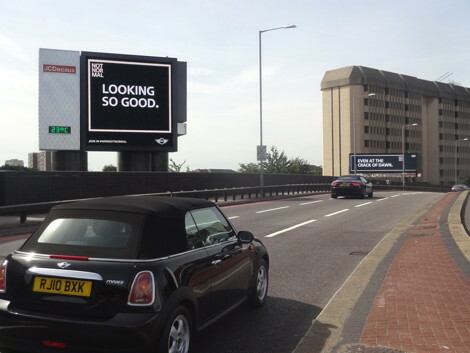 Challenged to produce a ‘not normal’ solution for Mini, JCDecaux used screens on the Cromwell Road to deliver real-time, bespoke messages to passing Mini drivers . Teams of ‘spotters’ were recruited to identify the colour, condition and model of approaching Minis, which enabled a personalised message to be quickly displayed on the screens in time for the drivers to see. Since JCDecaux acquired Concourse Initiatives to set up its own Experiential division, ‘Live’, Knight feels that digital screens (such as Transvision screens in major rail termini) have allowed advertisers to run evermore sophisticated experiential campaigns. The highly praised Lynx Angels campaign  is a great example of this, but in January of this year, British Airways used a combination of Transvision and Experiential with equally impressive results. Commuters at Victoria station queued for up to 55 mins to try a flight simulator, with the best performers winning flights to a range of exotic locations. Winners and leaderboards were displayed on the Transvision screens, which fuelled the excitement around the campaign, resulting on over 11,000 people taking part, and countless more sharing their positive experience on social media sites. 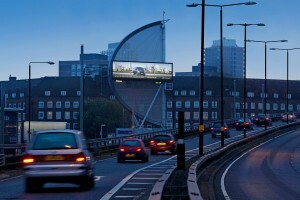 So what does the future of DOOH look like for JCDecaux? Well, the most immediate and exciting development is the new screen being installed at Waterloo station – Waterloo Motion . At the same size as Christ the Redeemer , or 3 double-decker buses – err, standard metrics for measuring length in media, Ed, the early feedback from ad-land is that this will be a show stopper. Despite its huge size, the screen can clearly display copy in size 8 font. Again, creative agencies will need to design specifically for the screen, given that it is not in proportion to any other screen in the market, but the technology behind the screens has been future-proofed as much as possible, meaning that it will be able to accommodate tomorrow’s ideas from creative agencies. As with the BA campaign, Waterloo Motion will also form an integral part of experiential activity at the station, but on a truly epic scale.